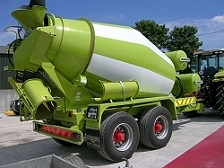 Tractor Drawn Mixers | Concrete Mixers | Tractor Concrete Mixer - Value Tech Ltd.
Value Tech cooperate with Liebherr to produce a range of Tractor Drawn Mixers varying in size and specification to comply with specific UK and Ireland transport regulations. Popular versions produced include a HTM 404 (4-5 cubic meter) and HTM 604 (6-7 cubic meter) Liebherr mixing and superstructure. These units are then combined with a specially designed trailer frame manufactured by Value Tech and equipped with customer specified running gear and specification. Nominal filling in hardened concrete (fresh concrete). Frame height between 100 and 180 mm depending on chassis. Weight details compl. assembled/ready for operation in accordance with DIN 70020, deviations +/-5%.